When moving to Thailand, in the beginning everything looks exotic, interesting and fun, just like it was on your holidays before. You have fallen in love with your new home; the land of smiles. Like with real love the novelty and mystery wears off over time. Gradually you start to change. 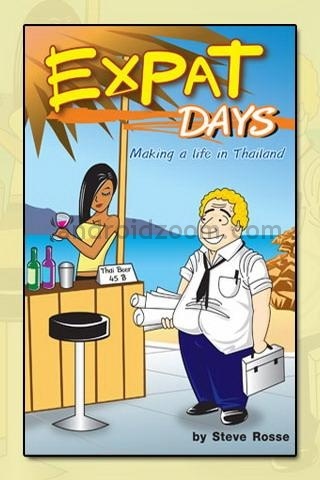 Following is a inventory of various behavioural types of long term expats I came accross in Thailand. Of course people can develop different behaviours mentioned below simultaneously. The grumpy expat, usually a man, gradually becomes acidified about everything which doesn't make sense or in his/her words 'is wrong' with the Thai culture, people and government. They often had a bad previous experience with a cheating Thai partner or just have an unhappy relation with the current one. These people are often entrepeneurs with their wife/girlfriend controlling personnel. Their situation is such that they cannot separate due to children and/or losing the bussines to their Thai partner. The grumpy expat will stereotype Thai (usually women) as 'lazy', 'careless', 'unreliable' and 'lacking initiative'. These people will feel Western superiority towards the Thai population and culture right from the start. After time they find it hard to live without this ego-boosting feeling they would lack back home. A man wants to buy a new car, he already made a choice but hesitates between two colors, red and metallic blue. The metallic blue can be supplied but not the red. He likes red the best, but also likes metallic paint, but not blue. After long hesitation, he lets the blue metallic finally prevail, also because the garage owner advises him to take the one which is on stock. After a few weeks driving in the new car he notices a red car from the same brand, he likes it less than he first thought. Unconsciously, he changed his mind. There is no longer a conflict between the desire for a red car and the fact that he chose blue. Expats often like to justify their new habitat, while they tend to portray the situation at home in a more negative way. Probably I have to include myself suffering from this syndrome, although I'm technically not an expat nor am I able (after two year) to categorise myself :). These are mostly older retired people who live in the countryside where they have a small farm or at least grow some own fruit and vegetables. They will defend old Thai cultural values tooth and nail. Most of them can get more upset about declining moral values of the Thai new generation than some of the most conservative natives. The 2011 Silom Songkran bare breast incident and the increasing extravagant little to reveal fashion of some Thai girls and ladyboys irritates them to maximum levels. These people are actively following Buddhism, either the incomprehensible Thai Buddhism which includes Hindu and Chinese gods as a backup, but more often the orthodox form of Buddhism. They practice yoga and often will not turn down a joint for more intense experiences. Most believe the West is wicked and evil prevails. A number of these people live from social welfare back home which becomes increasingly more difficult due to spending cuts and increased Thai prices. Some are wondering to move to Cambodia, Vietnam or Laos and as a new option the opened up Myanmar. These kind of people were also mentioned in a talk with Lani of Tell Thai Heart. It seems that many people have an urge to establish their identity. The fanatic gradually starts to exaggerate parts of his/her identity as a means to compensate for all things alien abroad. This can be in the form of the food one would take for granted back home, but is now willing to die for. For example longing for McDonald's food. Their perfect day is started with a breakfast exactly like back home. Exaggeration also can apply to the following: Practising or being over-fanatic about national sports from home, celebrating national fests, political views, religion and as Lani claims; accent. This group is a sub-group of the above fanatic group. Unfortunately I met a lot of these, so I name them seperately. Although not exclusively, similar to group 1 these are often entrepeneurs. They complain mainly about the situation back home, where foreigners, usually Muslim, 'fail' to integrate and spoil it for the rest. 1. They themselves chose to opt out and don't experience these 'problems' anymore, so don't need to complain. 2. They do not differ from foreigners back home, since they now have become the foreigner who has problems integrating. will not help to change their mind. Believe me I tried. Often these are women, but there's a considerable group of expat men too. Right from the start this person jumps in the deep. They will eat any food including spicy som tam which would burn the untrained. Rarely uses cutlery. Will learn the language, including Isan, in no time, fluently. If you meet them they will spends much more time talking to your Thai partner than to you. Will make your partner laugh out loud by telling jokes and funny stories in Thai, which is irritating, because you don't have a clue. These people are most commonly spotted in bars. They don't say much. Usually they will default to staring at the soundless sport channel. "Well, the beer is cold and the women are pretty.."
These people prefer to live in an area amongst compatriates. They like to hang out with their neighbours, talking in their mother tongue. They share national newspapers, magazines and if possible also share resources like workout equipment and if possible a common swimming pool. They will help eachother out in case of problems. They also organise social events like BBQ's and festivities during national events back home. Even though it seems they like to rearrange everything like the in country they came from, they feel more happy in their new coherent community than at home. Cost of living, climate, Thai marriage and conservatism plays an important role too. Or so Monk an expat Swede, must have thought when he started Svenskt Snus Co., Ltd in 2008. Snus is a moist powder tobacco product which is consumed by placing it under the upper lip for extended periods of time. Whereas cigarettes became popular less than 100 years ago, snus was discovered in the 16th century by Frenchman Jean Nicot, a man who became immortal when he discovered nicotin. Use of snus is a very popular (and addictive) pastime for Swedish and Norwegian men. To a lesser extend it is also being used in Finland and Denmark. Snus is banned in the rest of Europe due to improper research results, stating that it could cause cancer. When Sweden and Norway joined the European Community exemptions for legal production and use in these countries were made. Research has shown that thanks to snus Sweden and Norway have considerable less male smokers, whereas smoking amongst the female population seems to equal European averages. Yes, snus is a real male Viking thing. Europe is now considering to lift bans, since by any means snus is a healthier alternative than smoking. Although some people claim it is more addictive than cigarettes, in the rest of the world snus is fully legal and healthier tabacco alternative for adults. As advertised Svenskt Snus is made from 100% Thai tabacco. One box costs about ฿250 ($ 8 / € 6) and depending on consumption reportedly it lasts for about 6 days or so. A wholesaler for the South is located in Chalong, Phuket. The Southern provinces Phuket, Phang-Nga and Krabi appeal to many Scandinavian visitors and expats. In other araes in Thailand the product can be mail-ordered by individuals as well. 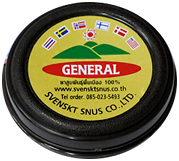 For more information about Svenskt Snus, click here. Monk is not alone, roughly at the same time, compatriot Karl started producing snus in Sihanoukville for the local market in Cambodia and there's even a Swedish snus manufacterer in Vientiane, Laos too. 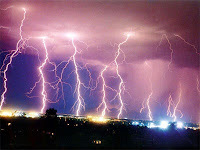 In case of lightning, lots of people disconnect their TV and other home equipment from the mains and other outlets like cable, to safeguard them from breaking down. Since many homes don't have surge protectors everywhere, it's the right thing to do, since if the lightning hits a power line nearby a high voltage spike will get in the mains and do it's destructive work. In Thailand lot's of people turn their cell phone off too, since it's an electric/electronic device. Is their any need to do so? I have had some arguments with Polly, who insisted on doing this. Since I don't like false feelings of safety, here are some more details I came across. Lightning is the discharge of static electricity from highly charged clouds in comparison to the neutrally charged earth. If the difference in charge becomes too high, air, preferable humid air will become a conductor which guides the discharge. Since many objects near the ground have a higher conductivity than air, lightning will find its the way of least resistance. Cell phones are usually located in your pocket, handbag or near your face when calling..
Devices which run on batteries have a neutral charge regardless of turning them on or off, but are not connected to the earth like TV's via the electric plug. Cell phones however do contain metal parts which could be dangerous, since if held nearby these parts form a conductor which could guide electricity to your body, if this would happen it would leave in the best case nasty burn wounds. Although I'm not sure this custom still exists, interestingly enough in Isan, North-East Thailand, casualties of lightning used to be burried standing up with a metal pan on the head, instead of being cremated. Only older people who died from natural causes were cremated, but this custom has changed over time. - In the safety of your home or (closed!) car, use of your cell phone would be a low risk issue. - When outdoors don't keep your cell-phone near your body, regardless whether it's on or off. 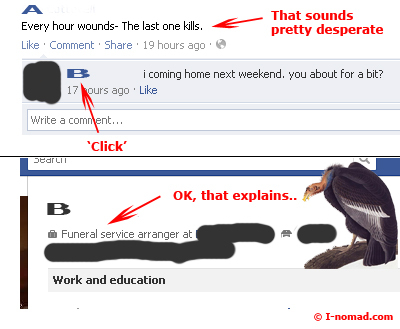 - More importantly, don't call outdoors! - Half an hour after the last strike, use of your phone is generally considered safe. Seen in Ao Nang, Krabi at the appartment of some nice bar ladies who offered us a bye, bye barbeque yesterday. In the mean time I got used to seeing young children or even babies being exploited for begging, selling roses or orchid necklesses at a time they should be well asleep. Often the mother is waiting around the street corner.